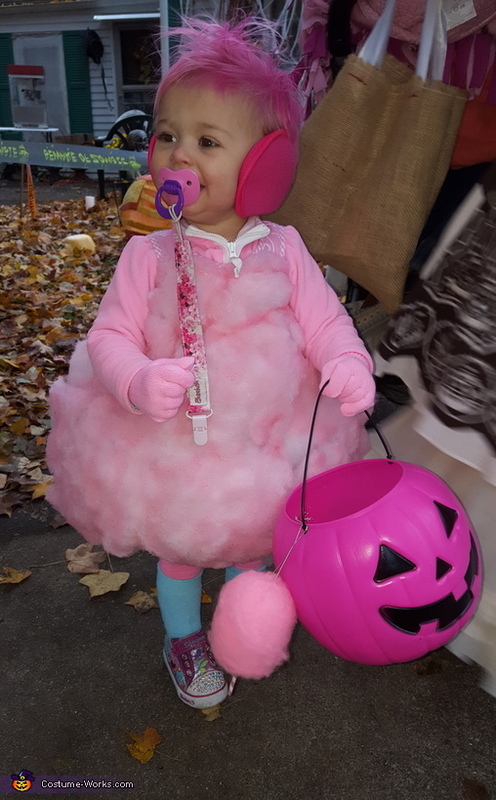 My daughter, Sophia (1 year old), as Cotton Candy! The idea crossed my mind while brainstorming about DIY costumes and the decision was finalized when I found the tiny cotton candy ornament that is hanging off of her candy bucket at Hobby Lobby. I dressed her in a pink fleece pullover and pink leggings then used an old pink dress that I glued/sewed cotton stuffing onto which I then sprayed with pink glow in the dark spray paint. I also sprayed her hair with washable pink hair color. Super easy, super cute!